Damien Kelly performs works from 'New Frontiers' at the Irish Embassy in London. Damien Kelly has been invited to give a performance of works by Ciarán Farrell from their latest album 'New Frontiers' at the 'Irish Showcase' concert in London on Wednesday the 10th of July. The concert which takes place at the Irish Embassy will include a mix of art, poetry, dance, film and music showcasing some of the best of Irish creative talent. Curated by the London Irish Centre and the Irish Embassy this invite-only event will be presented to a cross section of artists, media, members of the Irish community in London, London arts programmers and business representatives. The Irish Ambassador of Ireland Bobby McDonagh says of the evening, 'It promises to be an exciting and inspirational evening which will cement Ireland's reputation as a country with particular genius for artistic expression'. 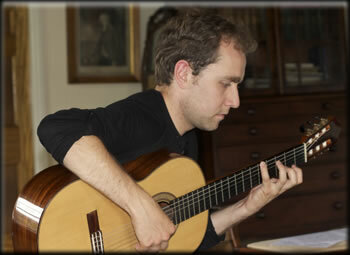 For this event Damien will perform two pieces, 'Lough Allen' from 'The Shannon Suite' and 'Jolt' from 'Songs for Guitar'.